I had a weekend pretty jam packed full of so I wasn’t sure I’d get much time to mess around with Holly the Pfaff. But, as I’m not ‘hip and with it’ and had no plans to go out clubbing on Saturday night, i had a play then. Instead of doing some free motion quilting to figure out what thread she did and didn’t like etc, and to figured out the tension, i did the last thing i should have been doing – starting a new quilt! 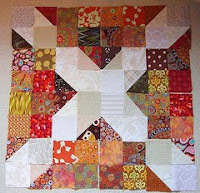 It an Arkansas Crossroads quilt and will be made from all brown/rust/beige scraps - to go with my bedroom. I hate scraps with a passion for some reason. I think it's because i haven't found a good way of storing them so they don't fit in with my OCD tendencies. I have piles and piles of the sodding things. Saturday evening i got all the 84 4 patches that i need made. I was astounded. Maybe everyone else does them that quickly but as i generally have the concentration of a gnat and get bored of chain piecing after about an hour, so i didn’t expect to get anywhere near that much done. Before work yesterday (i know, I'm obsessed) i got the HST triangles sewn and last night and this morning before work i trimmed them all. I've had to come up for air from my quilting as I've run out of quilting thread, so until Mr Postie brings me some more i have the perfect justification for doing this rather than the stuff i really should be getting on with.